How do you determine shipping container prices? Need to add storage to your yard? Consider a shipping container for a sturdy, weather-proof, theft-proof solution. Needing to expand your small business, but don’t have sufficient funds to build on to your present building? Look at a container unit with a “box office” package to gain the additional space. Interested in bringing the building costs down on your custom home project? Looking for a sleek, modern design? 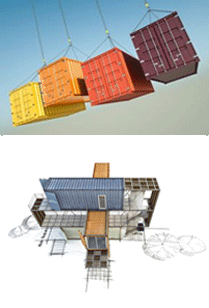 Shipping container prices can lower construction costs by 10-20%. Get custom design features for spec home prices. Quotes found in published videos and websites as of fall 2008 are $133 to $180 per square foot finished price for new construction, while custom homes can go for $200 to $300 per square feet in many parts of the U.S. This means that a standard 20 foot container will run about $24,000 to buy and finish with the purchase and relocation of a new container being about 10-20% of that total cost. An average 2000 square foot house utilizing several new shipping containers may cost $300,000 to build in areas where a new custom home of that size normally costs $400,000 or more. 1. First, clarify the kind of project you have in mind—personal or business space, construction or storage. Do you need the unit permanently, or for a given period of time. This may impact whether you buy or lease. 2. Do you need a new container, or will a used, refurbished container do? Obviously, the used shipping container prices will be much less expensive, approximately 30-50% of the cost of a new container. If you purchase a used container, make sure it is inspected to look at issues such as rust, integrity of welds, and any needed fittings that are missing. 3. How many containers do you need? There may be quantity discounts available. 4. Where do you live relative to the location of container manufacturers and leasing agencies? BuyerZone suggests that you look for a supplier within 75 miles of home. The transport costs are the most negotiable part of the deal, and they are dependent on distance. BuyerZone estimates delivery charges at $80 to $500 per container. 5. Do you have enough space on the property to maneuver a shipping container? You will need up to 100 feet of clear space to move in a 40 foot container. 6. Choose a container vendor. Consider their reputation, whether they are certified to meet ISO and other standards, look at the quality of their work, and get recommendations. Compare the shipping container prices of several vendors. An online site like BuyerZone can step you through preparing a request for a free price quote from several vendors. Call various suppliers and ask for a quote. 7. Work with an architect or designer. If they are employed to oversee the building process they will help you to select the best container source with reasonable container costs. Similarly, if you employ a general contractor, it will be his or her responsibility to make sure all materials come in at or below contracted costs and with the features and quality levels described in the specifications.